Have you lifted your D40/NP300 Nissan Navara and have a banging noise coming from the front end. D40 Navaras have no bump stop on down travel. When lifted more than 45mm the upper arm can come in contact with the coil bucket creating a metal on metal contact noise. This not only causes damage but limits down travel. The D40/NP300 also has limited adjustment for wheel alignment after the front after being lifted. The use of the Adjustable upper control arms (UCA) allows for more travel and extra adjustment when you need to wheel align the front end. PSR UCA’s offer up to +2 degrees of camber and -0 to +3 degrees of caster. These adjustable upper arms are designed by Performance Suspension and are by far the best arms on the market, with maximum down travel of approx. 660-670mm center of hub to guard this allows for more lift with the most amount of camber adjustment “on car” to get corrected wheel alignment. Arms come with the Performance suspension extended ball joint and feature full greasability and can be replaced later in life. 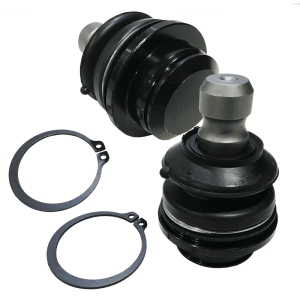 Ball Joint boot is a small diameter to reduce coil tower contact unlike other brands which tears, allowing dirt and water into the joint causing premature failure! 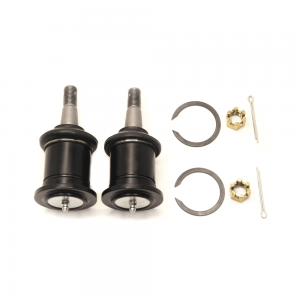 Supplied with an Australian made Poly Urethane inner pivot bush and powdercoated black these arms are a perfect solution for your D40 that has a camber issue or are needed for extra lift or both. Also check out the massive range of D40/NP300 items in store! For Maximum camber reduction trimming of the coil tower is required. Full Tech sheet supplied.